Increase the value of your property: even if you aren’t looking to sell straight away, it is important to keep this in mind. 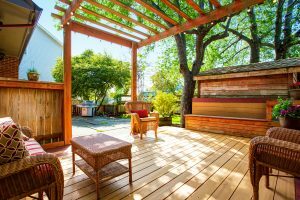 The notion of an outdoor room has grown in popularity in the past few years, giving your home an edge over other homes in your area. Perfect for entertaining: when you have guests over during summer it’s nice to be able to get outside and enjoy the beautiful weather. A pergola is the perfect space to achieve this. It will protect you if it’s too hot, keep the rain off you and offers a great entertaining space that looks stylish. Add to your landscape: a pergola makes for the perfect focal point in the landscape design of your garden. You can plan the rest of the features around it and draw people’s attention to its style and modern look.